During a private trip to his alma mater in the US, former president Lee Teng-hui yesterday appealed to Taiwan's public to cherish the "democratic achievement" that was last year's transfer of power, and urged the people to help President Chen Shui-bian's administration "get safely through the current difficult period." "President A-bian and his administration should overcome the difficulties safely," Lee said. "Although he is inexperienced [as president], he will gradually find the right course -- when handling foreign policy, cross-strait affairs and economic issues -- having governed for a year now." 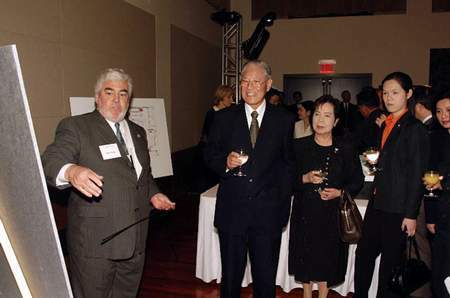 Lee was continuing to expound on the political line he had articulated in Los Angeles, Tuesday, and made his remarks during an address at a welcome banquet held by overseas Taiwanese groups, after arriving in Ithaca, New York. Lee graduated from Cornell University in Ithaca in 1968 with a PhD in agricultural economics. 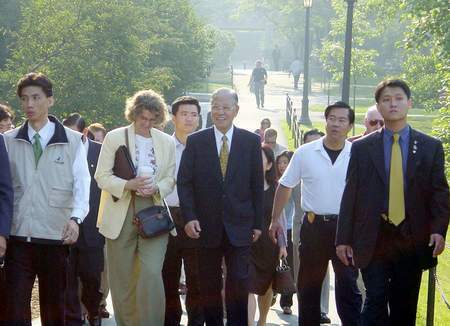 In 1995, Lee, then Taiwan's president, made a visit to Cornell which sent Taiwan-China and US-China relations into a tailspin. He returned yesterday to attend the inauguration ceremony of the university's Lee Teng-hui Institute for Scientific Research. In an apparent swipe at opposition politicians, whom he has accused of behaving like sore losers, Lee said the public should give the DPP government and Chen more time to learn. "Many people are still not used to the fact that power has changed hands, but I am very used to it," Lee said. "Just like someone who has just become a mother-in-law, the DPP government may act in a confused manner. Then the grandmother needs to teach and assist the mother-in-law," Lee said, adding that people in Taiwan and overseas should jointly "nurture" Chen. The former president also said he felt he could only retire when Taiwan's economic and political situation had been stabilized. "Some people want me to retire, which had also been my hope initially," Lee said, "but when I saw people creating havoc in Taiwan, I really couldn't tolerate it." 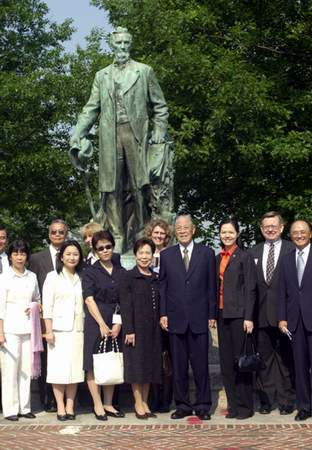 Lee asserted that having already served as president and KMT chairman, he had no further political ambition. "All I'm concerned about is stabilizing Taiwan's political situation." He also dismissed accusations that he betrayed the KMT to give secret support to the DPP during the presidential campaign, saying he would never do anything of the sort. "Some people say I secretly colluded with the DPP chairman," Lee said. "That would be treachery. I was the KMT chairman. I am not a disloyal man and I would never do anything like that." During his 40 minute speech in Hokkien, Lee earned frequent applause from the over 800 overseas Taiwanese present and he responded to the support by saying that he felt shame for failing to fulfill the dreams of all Taiwanese people during his presidency. "Since I stepped onto the political road, I must walk it to the end," Lee said. "I remembered that there were so many injustices when I was a child and I thought then that this was due to Taiwan's continuous rule by foreign powers. So, when I started my political career, all I was concerned about was how to change the situation." 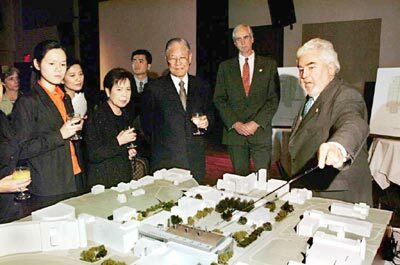 "I wept during the banquet at Los Angeles when I sang the song titled Formosa, My Dream, because I did not completely carry out my dream during my 12-year presidency." 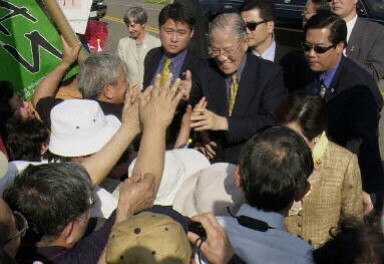 Lee left Los Angeles yesterday morning for Ithaca, where he received a warm welcome from an adoring crowd. 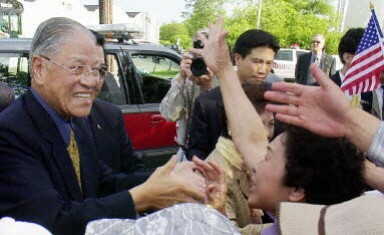 Supporters drove from as far away as Maryland and Washington to greet Lee, who has been heralded for his firm stance on Taiwanese sovereignty. Lee spent about five minutes shaking hands with members of the crowd. 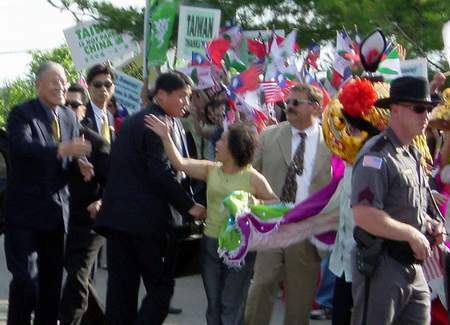 Although Chinese groups had said they would protest, there were no demonstrators as Lee arrived at the Tompkins County Airport.